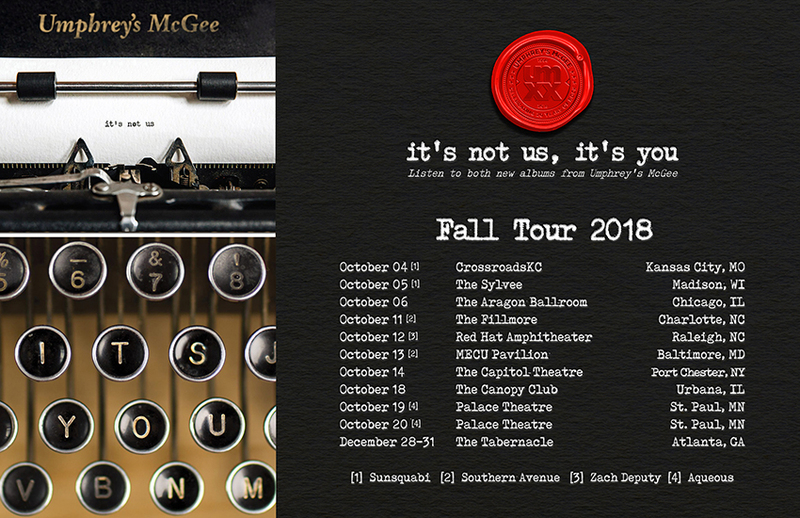 Umphrey’s McGee will be hitting the road this October! The tour begins in Kansas City at CrossroadsKC on October 4th, followed by a stop at the The Sylvee, a brand spankin’ new venue in beautiful Madison, Wisconsin on the 5th, before heading into The Big Weekend in Chicago, where UM will take the stage at the Aragon Ballroom on Saturday, October 6th. The following weekend, UM ventures east with stops in Charlotte, Raleigh, and Baltimore. We will be joined by Southern Avenue, a five-piece soul blues band, in Charlotte (11th) and Baltimore (13th). And we are thrilled to welcome back southern multi-instrumentalist Zach Deputy to the stage in Raleigh on October 12th. We will round out fall tour by heading back to the midwest for a return to the intimate Canopy Club in Urbana, Illinois on October 18th and a doubleheader in St. Paul, Minnesota on 19th and 20th where we will be joined by groove-rock foursome Aqueous. St. Paul will be the final stop on fall tour and will feature the only umVIP options for fans seeking ease and exclusivity on their big night out with UM, complete with a private show, multiple seating/viewing packages, exclusive merch, and more. A ticket pre-sale through Umphrey’s Ticketing and umVIP on sale for St. Paul will both begin Thursday, July 12th at 11:00 am ET, with a public on sale starting Friday, July 13th at 11:00 am ET.